As you know, babydaytripper is a big fan of London museums – they provide an unfailing array of free and low cost activities for babies and young children, and have some of the best facilities for family days out in the Capital. 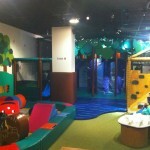 Our latest discovery, The National Army Museum, has gone the extra mile: dedicating a whole interactive gallery to the Under 8s, complete with an army camp themed soft play area. 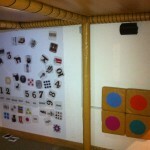 Entry to the Kids’ Zone gallery is by advance ticket (online booking). There are six, hour-long sessions per day, with 30 tickets available for each session (any unsold tickets are available at reception immediately before the session starts). Once inside, the Kids’ Zone is set up like an army camp with lots of tents and dens, soft play assault course and slides, a fort, train set, traditional rocking horses, a dressing-up box, arts and crafts and more. 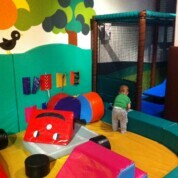 There’s even a self-contained soft play area for smaller babies. We were impressed by the well-organised and secure set up at the Museum. MJ managed to sustain a minor injury by tripping and falling against just about the only hard surface in the Kids’ Zone, and the staff could not have been more helpful (even producing an ice pack to tend his swollen lip – he, on the other hand, just wanted to get back into the action). I got the impression that a lot of families make an understandable beeline for the Kids’ Zone and don’t manage to see the rest of the Museum. If you have time, it’s well worth a visit. The permanent galleries explain the experiences of members of the British military throughout history, and how their lives influenced the world today. With plenty of reconstructions, models and interactive exhibits, you get a real sense of the sacrifices and rewards of being in the Armed Forces. One of the Museum’s current special exhibitions explores the popular novel “War Horse”. We’ve already been back to spend another hour in the Kids’ Zone. A fun, educational and affordable day trip – what’s not to love? Admission to the National Army Museum is free. A one hour session in the Kids’ Zone costs £2.50. It’s advisable to buy tickets in advance online (and to check the Kids’ Zone is not closed for a private party). The Museum’s pleasant Base Café serves very reasonably-priced hot and cold drinks, hot and cold snacks, cakes and ice cream. As a rough guide, a small cappuccino costs approximately £1.50. Kids’ meal deals and high chairs are available. If you bring your own lunch there are picnic tables outside the Museum. The Museum is accessible to pushchairs (there are steps between some of the different levels of the permanent galleries, but there seemed to be stairlifts available although we didn’t use them). 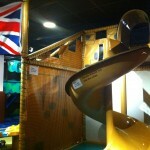 The Kids’ Zone is located down a ramp from the main reception. 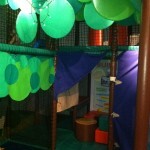 There are baby changing facilities in the reception/café area and inside the Kids’ Zone. The National Army Museum is open daily from 10am to 5.30pm. 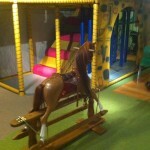 The Kids’ Zone is open from 10.10am to 5.15pm (six hour-long sessions take place daily). By train: The closest tube station is Sloane Square (District and Circle Lines), approximately 10 minutes’ walk from the Museum (no step free access). Victoria station (Victoria, District and Circle Lines, National Rail services) is approximately 20 minutes’ walk. By bus: 11, 19, 22, 211, 319, C1, 137, 360, 170.